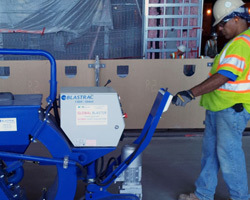 Our ride on scraping equipment is designed for a labor and time saving removal method of VCT, ceramic, rubber, wood, elastomeric, and any thick unwanted coating. 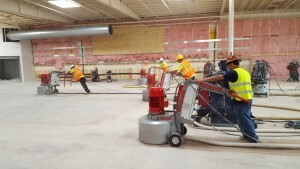 We utilize large hydraulic equipment to get the fastest removal on big decks and have small battery operated equipment for hard to reach areas and confined spaces. Diamond grinding and polishing is achieved by using horizontally rotating disks to level, smooth, clean, remove coatings and imperfections, or decoratively polish old and new slabs to a high shine. 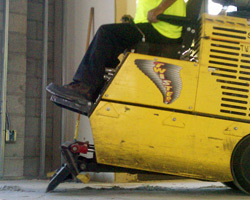 We utilize grinders from 4” hand detail to 30” planetary for polishing and leveling. Scarifying is used to remedy slab problems such as: curled joints, high spots, and uneven slabs. 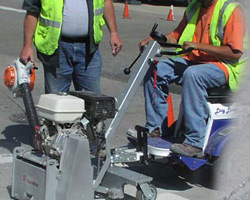 It is also used for the removal of Ardex, trowel down epoxy, traffic lines, and paint. We utilize hydraulic ride on scarifying equipment for heavy duty removal. Our gas powered and electrical scarifying is used to efficiently complete more light duty work. Our carbide cutting systems are used for high production removal of elastomeric and deck coatings. 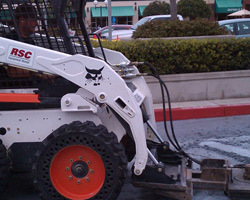 We utilize high pressured hydraulic ride on systems and our innovative custom skid steer attachments to quickly and efficiently remove any tough deck coatings.